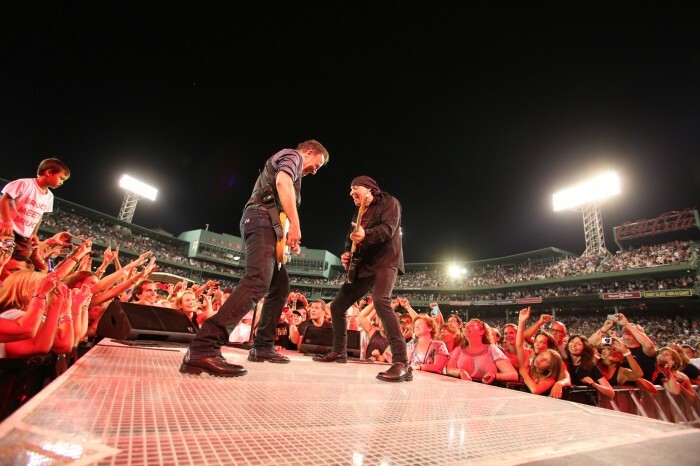 After barnstorming Europe for two and a half months and playing some of the most celebrated shows of their careers, Bruce and the E Street Band kicked off the outdoor leg of the US Wrecking Ball Tour last night at Boston’s 100 year-old Fenway Park. With the scoreboard below the famed Green Monster reading “Bruce Springsteen,” the show started strong with a one-two punch of “The Promised Land” and “Out in the Street.” The Irish lilt of “Death to My Hometown” felt especially resonant in Boston, but it was during “My City of Ruins,” a song that Bruce described as being about “learning to live with ghosts,” that the emotional depth of the show came to a peak. Boston had lost Red Sox great Johnny Pesky just the day before, and in tribute, Bruce asked the crew to shine a spotlight on the right foul pole, known in Boston as Pesky’s Pole. There was silence, a poignant moment, and then cheers. As Bruce said, the Fenway field had a mix of blood and sweat from all who had played there before, and it seemed that he and the crowd were ready to add some of their own as they all danced into the night. The set included highlights from throughout Bruce’s career: “Spirit in the Night” with Bruce and Jake Clemons sitting down front trading vocals and saxophone licks, a great pairing of “Darlington County” and “Working on the Highway,” and an amazing run of hits at the end of the night, from “Born to Run” to “Glory Days” to “Dancing in the Dark.” Even though Bruce physically carried a young boy up a few flights of stairs to reach the stage to sing during “Waitin’ on a Sunny Day,” he still had the energy to bust past the three-and-a-half-hour mark with the Boston favorite “Dirty Water” by The Standells and a final encore of “Twist and Shout.” Fireworks shot off from the top of the Green Monster, capping a night that will surely settle into the historic lore of Fenway Park.